Behind the French Menu: Beurre - Butter. Butter in French Cuisine. With purchases of an average of 8.00 kg per person in 2016, the French consume more butter per capita than any other country in the world. That is double the average consumption in Europe and three times that of the USA. That French dairies produce and consume some of the best butters in the world is not surprising coming from a land with over four-hundred cheeses. because I trust cows more than I trust chemists. From: This Organic Life, 2001. Organic food guru and author. The AOP butter from Normandy. The Norman farmers’ claim that their wonderful grass, and their unique cows, which came to France with the Vikings, are responsible for this special butter; they claim this butter’s peers cannot be found. This butter is distinguished by a soft texture and its strong a yellow color in the summer when the cow’s graze freely on grass. Isigny in Normandy is also home to France’ only AOP crème fraiche, three AOP Calvados apple brandies, Pays d'Auge Cider AOP; and four AOP cheeses Camembert de Normandie, Livarot, Neufchâtel, and Pont-l’Évêque. The AOP butter from the old province of Bresse. This butter is churned in the traditional manner, which gives it a particularly soft, supple and airy texture. 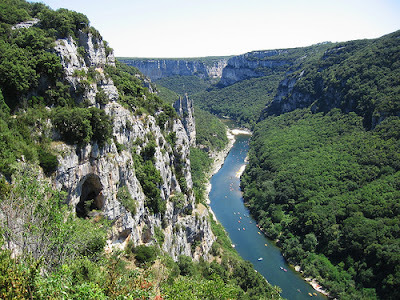 The old French province of Bresse cuts through the departments of Ain and Saone-et-Loire, to the edge of the Jura bordering Switzerland. Bresse also has an AOP fresh cream, the Bress Bleu cheese, the Bleu de Gex and Comté AOP cheeses and the unique Vollaile de Bresse, the only AOP poultry in France. Photograph courtesy of Le Coq d’Or Dairy. The AOP butter from the old region of Poitou-Charente. The departments of Poitou-Charente, Charente, Charente-Maritime, Deux-Sèvres, Vienne since 1-1-2016 are included in the new super region of Nouvelle Aquitaine. This butter is made from pasteurized cream and then matured for at least 12 hours to develop its aroma and taste before churning. 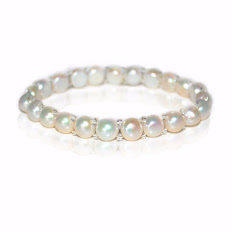 The result is butter that has a noticeable smell of fresh cream along with fruity notes. Pastry bakers particularly like Charentes-Poitou AOC/AOP butter because it melts slower than other butters, a quality that makes it the king of puff pastry. 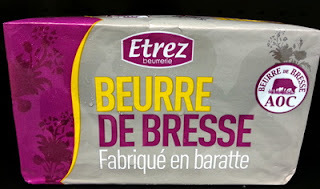 There are a number of villages with dairies where this butter is produced, and you are just as likely to see one of the village’s names on butter’s wrapping; however, to make sure the consumer knows that the butter is a real Charentes-Poitou butter also carries carry the mark of the villages where this butter is made: Beurre de Celles-sur-Belle, Beurre de Deux-Sevres, Beurre d’Echiré, Beurre de Grand Fermage, Beurre de La Viette, Beurre de Lescure, Beurre de Montaigu. Beurre de Pamplie. Beurre de Surgères. Also from Poitou-Charente come a Beurre Sec de Feuilletage AOP- A butter with more than 84% fat made especially for patisseries. Apart from butter all of France’s Cognac comes from Charentes-Poitou, as does the Chabichou du Poitou AOP goat’s cheese and the white and rosé Aperitif Pineau des Charentes. 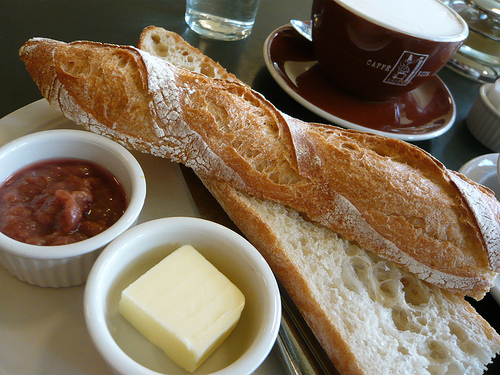 A fresh baguette, butter, and jam. Can a French breakfast get any better? Photograph courtesy of Jessica Spengler. For a light-hearted story about my ordering eggs for breakfast in France click here. Butter is essential for French cuisine and above all, for practically all French pastries,. A properly made French croissant will be approximately 40% butter by weight. The small local patisserie near your hotel will, probably, alone, be using tens of kilos of butter every day. Breakfast in a French home always includes a tartine beurré, bread, and butter, and few French chefs would dare to fry an egg in anything but butter. 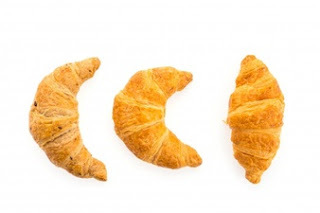 With so many recipes and pastries that include butter, you may wonder why the French have less heart disease and cholesterol than most other nations. The two glasses of red wine that the average Frenchman and French woman drink every day has been proven to aid in the prevention of heart disease. So, apparently, the French can survive a surfeit of butter. Over 80% of French butter comes from commercial and co-operative dairies that have large-scale production methods. In the remaining 20%, there are the many farms that produce butter on their own or work with small-scale cooperatives; that is true for French farmhouse butter and butter made with unpasteurized milk. The medium sizes dairies include the producers of France’s three AOC/AOP butters. 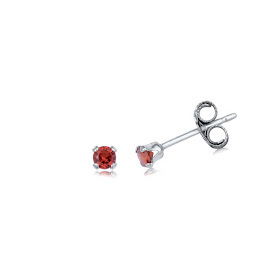 The wide choice caters for every taste. 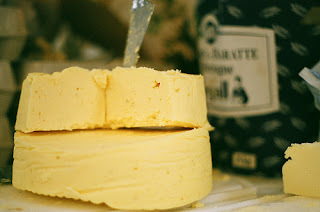 Other farms and co-operatives specialize in sheep’s and goat’s butter; however, this post is only about cow's milk butter. The Pan-European AOP (PDO in English) Label. 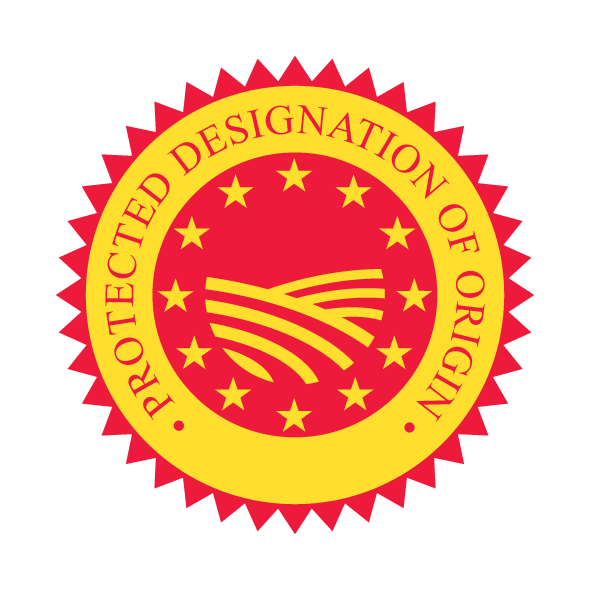 that stands for Protected Designation of Origin. The color of French butter. The color of all French butter is entirely natural and all of France’s cows will be grazing freely, some for up to for up to nine months of the year. During that time they will produce butter with a yellow tinge from the carotene in the grass and herbs. In the winter snows, the cows stay in warm barns and eat hay and fodder from the same areas where they graze in the summer. Winter fodder produces a lighter colored butter. Outside France and Europe, a great deal of butter is colored with synthetic carotene and or other additives. France’s three AOC/AOP butters cannot rest on their laurels, they must pass regular organoleptic tests that check taste and smell. 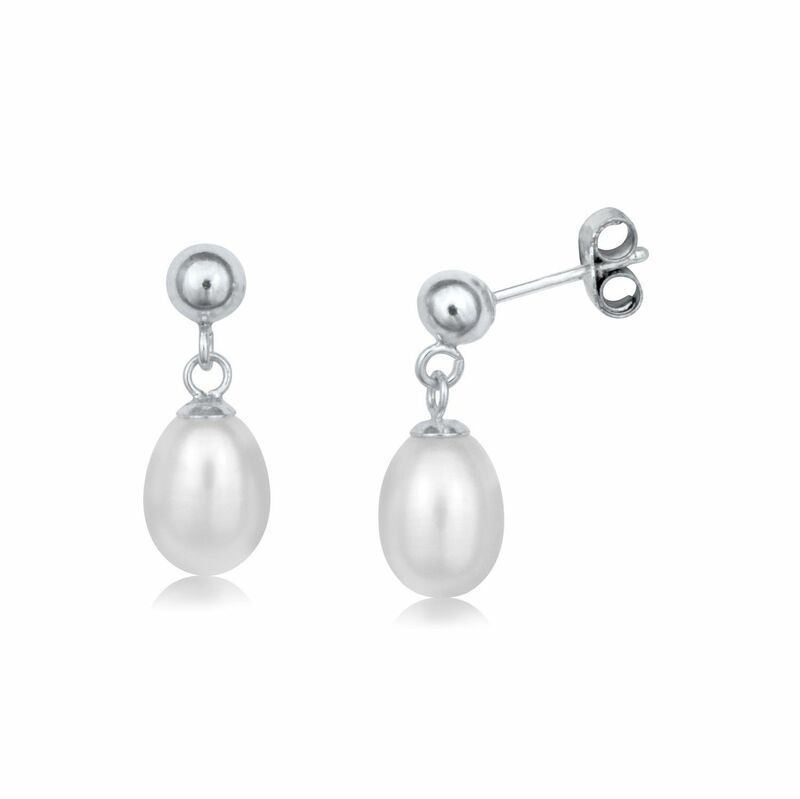 I have included those that are most often seen on French menus or on supermarket shelves. To include all French butters and butter sauces would require a separate book or two . 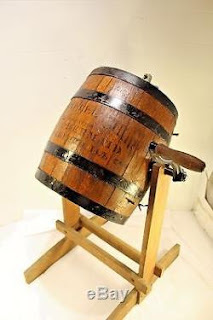 A barrate, a traditional small farm butter churn. Beurre à la Ciboulette – Chive butter; a cold butter mixed with chives and shallots. This is a Beurre Compose, a compound butter; that is a sold butter that after being mixed may be served cold as a condiment, spread on a baguette on bread or in thin slices, used to melt while placed on fish, meats or vegetable dishes. Beurre Allégé - Low-fat butter. This will not usually be on your table in a restaurant, but it is available in the supermarket. 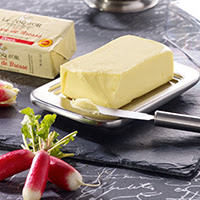 French low-fat butter can have anywhere from 15% to 41% fat as opposed to regular French butter with a minimum of 92% fat. Regular French butter is at least 82% fat. Beurre au Citron Verte – Lime and butter sauce. This sauce which apart from a small amount of garlic and black pepper is just butter and lime juice lightly heated and poured as required, over fish dishes. Beurre Bercy – Beurre Bercy is a Beurre Compose, a compound butter. After being prepared, it will be served cold as a condiment. This butter’s recipe includes veal or beef marrow, white wine, shallots, parsley and a touch of lemon juice. The butter will be decoratively placed on a steak or slices from a roast and allowed to melt over the meat flavoring it. Bercy, now part of the12 arrondissement was, until the beginning of the 20th Paris’s central wine market. Most of the wines that we now know as blends from Bordeaux and elsewhere got their first public tastings there as did the two other famous Bercy wine-based sauces. The butter will melt slowly on the fish and add its flavor. Beurre Bio – Organic butter. 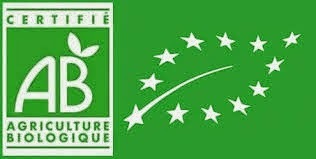 All French organic products and produce must be clearly labeled with the French AB Green label which stands for Agriculture Biologique. The regulations for organic foods and wines in Europe are stricter than those in North America. Many organic products also carry the Pan European green leaf logo. Beurre Blanc – One of France’s favorite butter sauces. (See Beurre Nantaise in this post). Beurre Blanc Nantaise – The same as the beurre blanc above. (See Beurre Nantaise). Beurre Café de Paris - A compound butter and parsley sauce created for entrecôte steaks and now seen with many other meat and fish dishes. The sauce received its name from the Café de Paris in Geneva, Switzerland, where it was first served. Beurre Citronné - A lemon flavored warm liquid butter sauce poured on fish and shellfish dishes just before serving. Beurre Clarifie – Clarified butter. Clarified butter is made by melting the butter and removing those components that rise to the surface as well as the solids that fall to the bottom. Clarified butter will be used for its unique taste qualities in sauces and in dishes where it allows the chef to cook at a higher temperature than do regular butters. Beurre Cru – Butter made from unpasteurized milk. The herds of cows, sheep, and goats that produce the milk for France’s unpasteurized cheeses and butters undergo strict and uniquely successful controls of the milk they produce. No other country is willing to spend the time and manpower to control so many unpasteurized milk products. Unpasteurized butter is sold fresh and should be used within one to two days. Beurre Cru d’Isigny Label Rouge. Isigny which produces one of the three AOP butters also produces thus hand-made butter. It is made in the traditional manner, including whacking it into shape, by hand, with wooden paddles. In the UK those paddles are called Scotch hands. Why are they called Scotch Hands, I do not know? 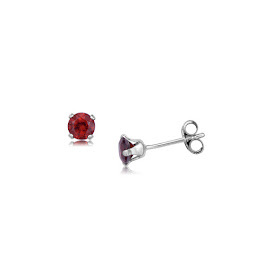 That despite being born about fifty miles from Scotland. Beurre d'Ail - Garlic butter sauce. (See Beurre d’Escargot). Beurre d'Anchois – A compound butter made with garlic and anchovies mixed together and usually seen when served on slices of bread or baguettes. Beurre d’Escargot also called Beurre d'Ail - Snail butter. This is a cold compound butter used for Sauce d’Escargot also called Sauce Beurre d'Ail, garlic butter sauce. This is a garlic flavored, but certainly not overly garlicky, butter sauce. The sauce began as the flavor behind France’s most famous snail recipe, Escargots à la Bourguignonne, snails served in the manner of Burgundy. Despite the name, there are no snails in this sauce, not even a smidgen. If you are not a snail aficionado, worry not, outside of dishes with snails this butter is 100% snail free! Beurre d'Estragon – A compound butter flavored with the herb Estragon, tarragon, salt, and pepper. Tarragon is an essential part of the herb group Les Fine Herbes and the primary flavor behind Sauce Bearnaise. 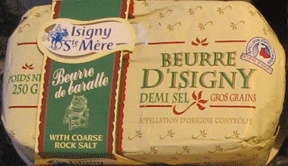 Beurre d'Isigny – See the AOC/AOP butter at the beginning of this post. 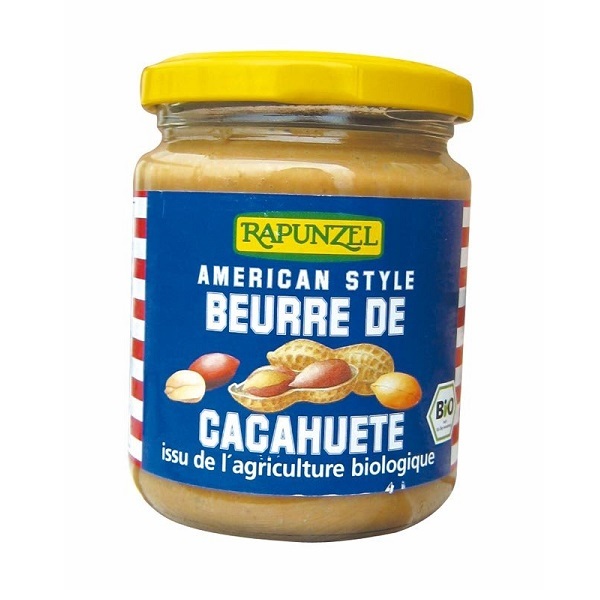 Beurre d'Arachide or Beurre de Cacahuètes – Peanut butter. Many French kids like peanut butter on their morning tartine beurrée, bread, and butter, though their preference will probably be for Nutella or chocolate spread. French and imported Peanut butter are available in all supermarkets. Rapunzle peanut butter on sale in France. Beurre de Bresse AOC/AOP - See Beurre de Bresse AOP at the beginning of this post. 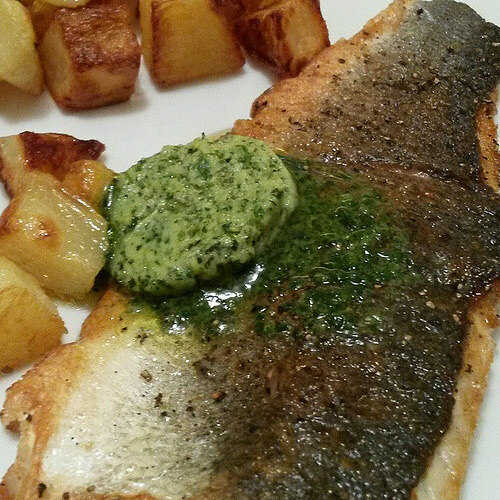 Beurre de Montpellier – This butter sauce was traditionally only served with cold fish dishes. The sauce is made with the yolks of hard-boiled eggs, anchovies, cornichons, shallots, capers and herbs that will include chives, tarragon, spinach leaves, watercress and parsley among others. Beurre Demi Sel – Lightly salted butter; these butters may have from 0.5% to 3% salt, the exact amount will be on the label. Beurre Doux - Sweet unsalted butter. Beurre Fin – This translates as fine butter, is made with pasteurized crème but up to 30% of the cream used in its manufacture may have been frozen. Beurre Fondu - Melted butter; the same as beurre clarifié. Beurre Fouetté – Whipped butter. 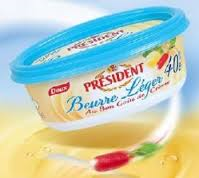 Beurre léger - Light Butter. Less than the minimum 82% required for regular butter. Beurre Maître d’Hôtel – A compound butter flavored with lemon juice and parsley and served as a condiment. Beurre Maitre d’hotel will be placed on a steak, roast or fish; as it melts, it adds flavor. These butters are served cold and added as a condiment; they are not a sauce. Beurre Maître d’Hôtel flavoring a steak. 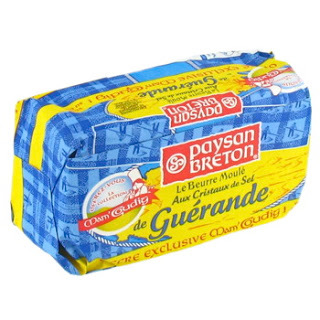 Beurre Manié – This butter will not be on your menu, but it a chef may mention it. This is butter kneaded with flour that is kept in the refrigerator and used in emergencies to thicken sauces. Beurre Meunière – A heated clarified butter flavored with lemon and parsley and used for preparing fish and seafood dishes. The most famous dish made with beurre meuniere is Sole Meunier. See Dover Sole, in France often called Sole Française. Beurre Montpellier – A compound butter served with fish dishes containing tarragon, chervil, chives, parsley, stew, watercress, shallots, egg yolks, salted anchovies and. of course, butter. Beurre Mousseux - A butter sauce made by allowing the butter to bubble and foam on the stove. It will be lightly whipped. Beurre Mousseux may also be on the menu as part of the description of how a dish is served. Beurre Nantaise - The beautiful city of Nantes, set on the River Loire, is the regional capital of the Pays de Loire and is honored with the creation of this white butter sauce also called Beurre Blanc. This sauce is one of France’s most famous and served with fish, seafood or vegetable dishes. The sauce is made with butter, a dry white wine, lemon, and shallots. Chefs change the percentages of the ingredients and may use white wine vinegar to suit the fish, seafood or vegetables with which the sauce is served. Beurre Noir – This butter sauce’s name translates as black butter though, despite that name the butter is only cooked until it is a dark brown, not black. Black butter has a strong taste and it is the classic sauce for skate, the fish, and is often prepared with added capers and or parsely. Beurre Noisette – A melted butter sauce. Noisettes are hazelnuts, and here the butter is melted until its color resembles the color of hazelnuts and it has a slightly nutty flavor. Beurre Persillé – Parsley butter. A compound butter condiment made mixed with chopped parsley shallots and garlic. 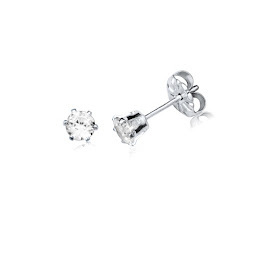 It will melt on and flavor the dish with which it is served. Beurre Pommade - A plain butter mixed and pounded to achieve the soft and consistency of a pomade. This is often the butter that will be used to cook a steak or fish rather than using oil. Beurre Pamplie AOC/AOP – See the Poitou - Charente Poitou AOP butters at the beginning of this post. Beurre Rouge – A butter sauce made with and red wine sauce and shallots and served with fish and seafood. Beurre Ramolli -Another name for a beurre pomade, a softened butter (See Beurre Pommade). Beurre Salé - Salted butter; between 3-5% salt; the exact amount of salt will be on the label. This is a butter you may choose for your morning baguette and butter, your tartine beurrée. Beurre Salé - Salted butter. Beurre Sec - This may translate as dry butter, but it is not dry it is a special butter prepared for pâtissiers, pastry makers, with at least 84% fat. American butter must by law have at least 80% fat. 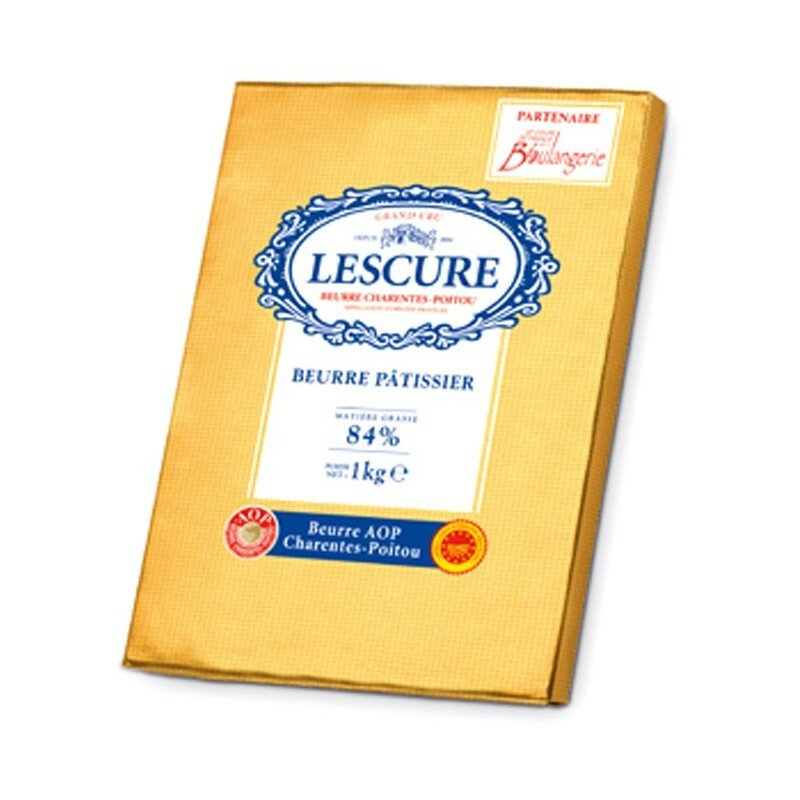 European, including French Butter must have at least 82% fat and this beurre sec has at least 84% fat. Beurre Sec de Feuilletage AOC Poitou-Charente – See Beurre Poitou-Charente AOP at the beginning of this post. Beurre Vierge – A compound butter flavored with lemon juice, salt, and pepper. AOC and AOP on France's Foods and Wine labels? Why is the AOC becoming an AOP? Ail -Garlic in French Cuisine. Herbs and Spices in the French Kitchen. Anchois - Anchovies. Anchovies, Anchoyade and Tapenade in French Cuisine. Looking for Anchovies in the Fishing Village of Collioure. Bleu de Gex AOC/AOP – One of the Jura’s Most Famous Cheeses. Bleu de Gex on French Menus. Bœuf Charolais - The Charolais Cattle, the Charolais Beef. Le Bœuf Charolais du Bourbonnais AOP. Cabillaud - Cod, the Fish. Cabillaud is Fresh Cod, Morue is Rehydrated Cod. Cod is the Most Important Fish in the World and the Most Popular Fish in France. Calvados – The Most Famous Apple Brandy in the World. Calvados on French Menus. Coquilles Saint-Jacques and the Vanneaux or Pétoncle. The King Scallop and the Queen Scallop. The Coquilles Saint-Jacques, and the Vanneaux or Pétoncle in French Cuisine. Cresson, Cresson de Fontaine - Watercress in French Cuisine. En Croûte (En Croute) on French Menus. Entrecôte (Entrecote). Ordering a Perfect Entrecote Steak in France. Escargots - Snails on French Menus and How to Order Snails in France. If You Enjoy Cockles, Mussels and Conches, Then Snails will not be Strange. Fleur de Sel - The flower of salt. The Special Crystals of Sea Salt Used in French Cuisine. 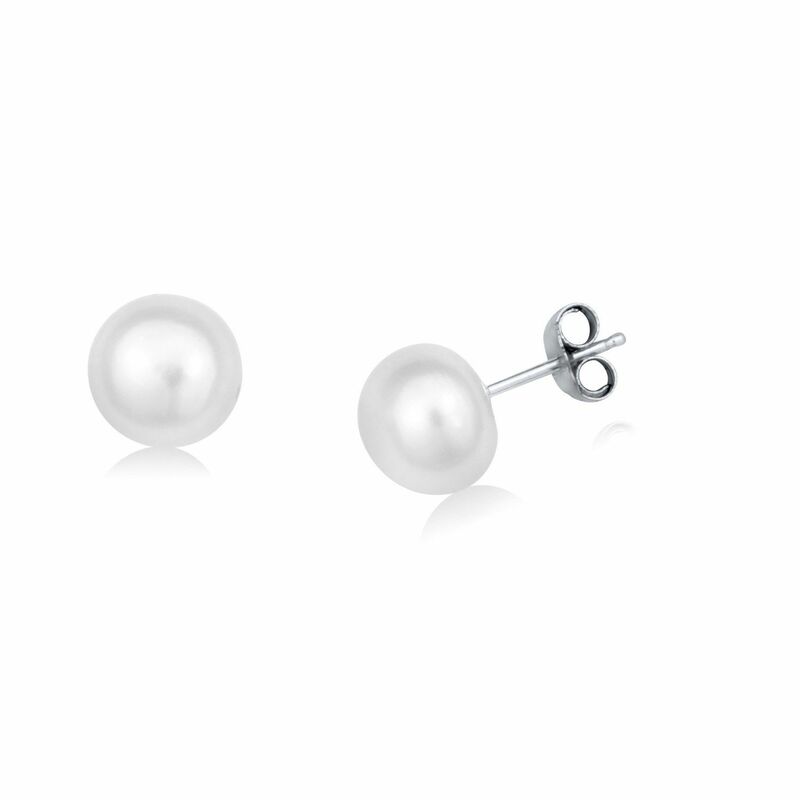 Huitres - Oysters I. Ordering, Eating, and Enjoying Oysters in France. Livarot AOC/AOP – Livarot Cheese. Livarot is One of France’s Tastiest "Aromatic" Cheeses. Livarot in French French Cuisine. Neufchâtel (Neufchatel) Fromage AOP. The Coeur de Neufchâtel, the heart-shaped Neufchâtel cheese. Pineau des Charentes; the Aperitif of France’s Cognac region. Cognac III. Poivre - Peppercorns. White, Green, Black and Red Peppercorns in French cuisine and on French Menus. For hundred of years pepper was the most important spice in the world. Saumon - Salmon. Atlantic Salmon is the Salmon on French Menus. Sauce Bercy, the Classic Sauce for Fish; Sauce Bercy for Meat Dishes and Beurre Bercy for Steaks and Roasts. Sole Française. Dover Sole or Sole Française on French Menus. Dover Sole in France may be on your menu as Sole Française. The Fish are the Same, They Just Have Different Passports! Steak Frites. 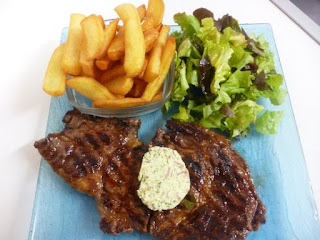 How to Order Steak Frites in France. An Introduction to the Onglet and the Bavette, the Cuts that Made Steak Frites Famous. Volailles Fermières Label Rouge – France’s Label Rouge Poultry and the Volaille de Bresse AOP, The Tastiest Poultry in France. Copyright © 2010, 2012, 2014, 2015, 2018. Great reading, makes me want to catch the next flight to Paris for some good 2 hour breakfast!! Your own blog on butter is absolutely great. The pictures also are amazing. What a great butter filled world we have.